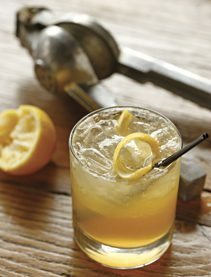 Bartender Colin Shearn says this cocktail can be made by substituting the syrup, lemon juice and club soda for an equal amount of Dr. Brown’s Cel-Ray soda. Otherwise, the syrup (and infused rye) should make enough for at least a dozen drinks. Combine the first 4 ingredients in a shaker with ice. Shake well and pour into an ice-filled glass. Top with club soda and garnish. Toast the slices of pumpernickel and place in a large container with an airtight lid. Toast caraway seeds in a sauté pan over medium heat until they become very fragrant, and add them to the toasted bread. Pour rye over bread and cover. Refrigerate for two to three days. Strain rye into a bottle and discard the bread and caraway seeds. Dissolve the water and sugar in a saucepan over medium heat. Add the celery and celery seeds and lower heat. Simmer until celery is tender, approximately 10 minutes. Carefully process syrup in a blender until smooth. Strain into a bottle and refrigerate.